For the past year, Telecare's programs and Quality Department have been hard at work preparing for an intensive survey by CARF International, an independent nonprofit organization dedicated to advancing the quality of health and human services at hospitals and rehabilitation facilities worldwide. After a week of on-site visits from CARF surveyors in August, we were pleased to learn CARF awarded Telecare a three-year accreditation status. 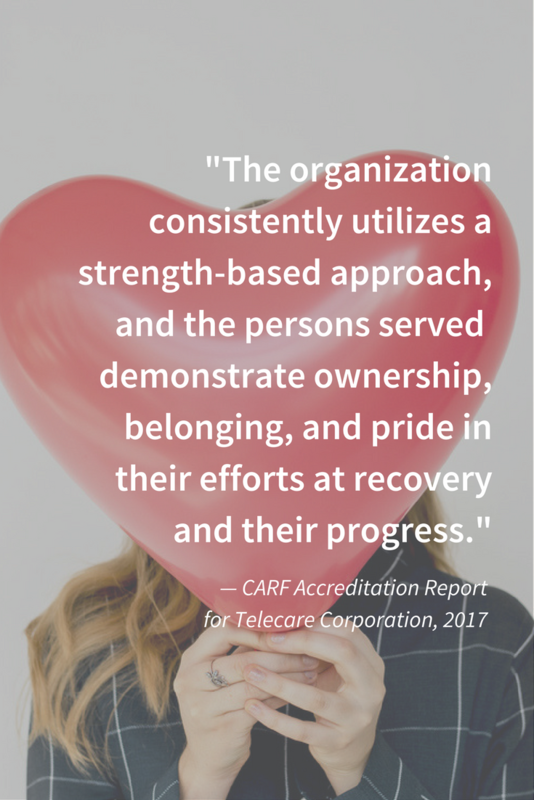 In 1998, Telecare chose CARF to accredit its Assertive Community Treatment (ACT) and residential programs because the CARF standards focused on person-centered practices, a strong match to Telecare's values and philosophy of recovery-centered services. Now, Telecare has over 75 CARF-accredited programs in eight program types and three special populations (Justice Involved, Older Adults, and Children and Adolescents). Additionally, Telecare has three hospitals that are Joint Commission accredited. The survey preparation is a unifying and engaging process, where direct-care staff and leaders come together to review and confirm their conformance to standards and prepare to demonstrate unique best practices to CARF surveyors. Telecare utilizes CARF and Joint Commission standards as a foundation for policy and adherence to high quality practices at our programs. We maintain conformance to these standards continuously, and prepare for the surveys by readying materials and evidence to demonstrate our program's excellent quality, best practices, and its high-involvement and recovery-centered cultures. This year, CARF released a more detailed report on strengths and areas for improvement, recognizing Telecare’s organizational practices, our leadership, and individual programs. Below are a few findings from the 2017 CARF Accreditation Report for Telecare Corporation. "Introducing its Whole Person Care and Wellness curriculum, Telecare is committed to developing an integrated primary care and behavioral health model." While surveying some of our Northern California programs (SOAR in Sacramento, Jeremy House in Stockton, and TRAC in Modesto), CARF noted “the persons served interviewed reported considerable satisfaction with the services offered…One member stated that Telecare is like ‘an oasis from a life of difficulties and obstacles.’ Another member stated that 'the program literally saved [his] life.'" Telecare continues to utilize CARF standards and its Clinical Quality Standardization Committees to drive consistency in best practices and conformance to CARF standards.